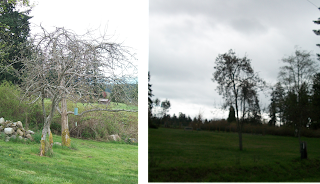 We are very blessed to have a few heirloom fruit trees on our property - two apple trees, a pear tree and several cherry-plum trees. The critters - big and small - hooved and winged - all love our fruit trees! After a good pruning last year, the apple trees were very fruitful this year. The apples themselves aren't show-piece apples, but they are so tasty and aren't sprayed with any pesticides. I thought I'd try out some new recipes featuring apples. This past week I made pulled pork served with apple coleslaw and apple cider! Nothing goes better with pork than apples! A happy customer eating his third serving! Place the shredded cabbage and carrot together in a bowl with the sliced apple, and toss to combine. In a separate bowl, stir together the honey, brown sugar, vinegar, pineapple juice, and mayonnaise until the honey and sugar have dissolved completely. Pour over the salad, and toss to coat. Season with salt and pepper, and toss again. Cover and chill until ready to serve. Put the meat in a slow cooker; pour cider and BBQ sauce over meat. Cover and cook on low until well cooked and the pork shreds easily, 6 to 7 hours. Note: the actual length of time may vary according to individual slow cooker. Drain well. Shred pork using a fork to pull it apart. Serve on tasty roll. More apple delectables on their way later this week! Keep toasty warm with some warm apple cider.